Farmers will get their first look at New Holland’s recently launched T5 Utility tractor range alongside its latest round and square baler models at Grassland and Muck on 24 – 25 May 2017. 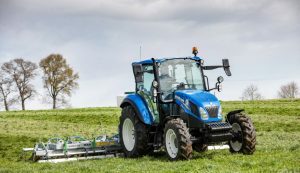 New Holland has added a further five models to its T5 range of tractors to complete the mid-range tractor line up. The latest Utility models offer between 75 and 114 hp and continue the heritage of New Holland’s well-regarded T5000 series – 24×24 Dual Command transmission, capable performance and compact size, and all at a competitive price. Alongside the first showing of the New Holland T5 Utility tractor, the extensively renewed and upgraded RollBaler 125 and BigBaler 1290 Plus models will be on display at Grassland and Muck. The RollBaler 125 offers the best choice in fixed round chamber baling for silage or straw – even when working with heavy grass, dense hay or large, dry, brittle straw swaths. New Holland will be at Grassland and Muck from 24-25th May.